Well, well, well. Who knew that Carlos Carrasco could be so much damn fun? Two gentleman, that’s who. They go by the names of DStars45, and Swindaman3. And they’re the stars of the 2015 Gentleman’s game because they make the bold calls. They’re good under pressure. They can probably drive their vehicles through rush hour with their knees on the way home from work… all while setting their gentleman’s game lineup. They make the bold calls with the chips in the middle of the table. Calls like using Carlos “Jekyll and Hyde” Carrasco against the DFS kill your pitcher buzz-saw that is the Kansas City Royals. Now one caveat would have been that the game was in Kansas City, which suppresses offense. The other side of that is when you trust a player who wears a Cleveland uniform in any sport, it typically ends badly. These two brave warriors were rewarded with the first and second places in the Friday night game and will enter this Friday, the Gentleman’s Game Final with a chance to become the Gentleman of the Year. We’ve had calls from different sponsors inquiring about doing a deal with the winner of this eventual title. Nothing is set in stone at this point, but the man who wins this contest stands to win a lifetime of fame and riches if they can come up with a big performance Friday night. Swindaman3 was incredibly heroic, winning the Friday night game by a mere .15; the closest finish between first and second in the illustrious history of the contest. A look at the standings reveals what is needed for each gent, and what is at stake. The bottom feeding gentleman will not merely look to just stay out of the basement and not finish last but to play spoiler for the likes of Swindaman3. It is here that past vengeances could be sought out. It is here that lifelong friendships are made, and lifelong foes are adopted. 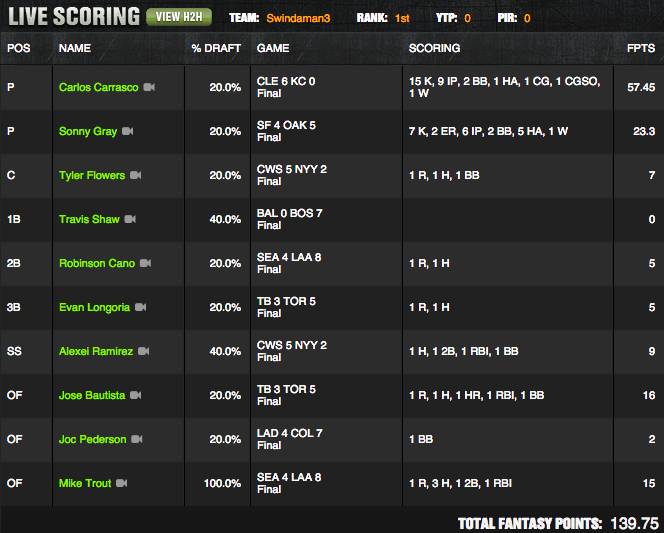 And here is a look at the winning lineup by Swindaman3. All joking aside, it really was a clutch performance. Look at him using Tyler Flowers AND Travis Shaw there. Look at him getting underpriced Mike Trout into the mix along with Sexi Alexei. Who would have had the guts to use Sonny Gray as bad as he’s been this last month plus against the NL version of the Royals; the Giants? Swindaman3, that’s who. This is why he is in this position, and three other gents are not. He must hope for a last place finish from DStars45 and he must win first place next week. His pursuit of first place has been one of the most courageous acts ever seen in the fantasy realm, daily or otherwise. “You really don’t know pressure in life until you’ve had your back to the wall in the Gentleman’s Game,” said an exhausted Swindaman3 on Sunday night from his home. “I don’t know what I’ll go with on Friday night, but I hope most of DStars45’s players get rained out”. So we ask for the final time in 2015…. what will happen next week? Will T3bird rise up and kamikaze Mr. Swindaman’s hopes through the branches? Will any gent decide to use Kelby Tomlinson if he’s there and in the lineup for 2000? 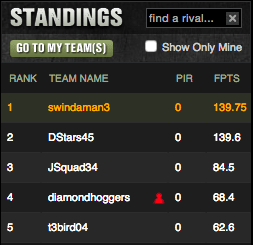 Or how about the fierce battle between diamondhoggers and JSquad34 to not get last place? Will Dstars45 put together a fourth place or better lineup to secure the first Gentleman’s game title, and all the prize money and endorsements that comes with it? YOU MUST TUNE IN NEXT WEEK TO FIND OUT! Next Story → A Gentleman’s Cup Series Champion has been Crowned!